THE FIRST THING I want you to know is that, with some caveats I’ll touch on in this story, I usually don’t agree with keeping dolphins penned up in captivity. But when I had a chance to swim with dolphins at Dolphin Discovery on Cozumel in the Caribbean, I did not stand on principle. I wanted to do it so badly, I signed on without hesitation—even though I knew there would be a commercial element to the experience. Dolphins know how to have fun. And fun is part of joy. And joy is what feeds our souls. I saw Sam Brown on TV going on a cruise through the Caribbean, just like I did, and she stopped at Dolphin Discovery Cozumel to swim with the dolphins, just like I did. It brought back wonderful memories to watch her being pushed and dragged by the dolphins in the well-paced games that each guest gets to experience. It did not surprise me one iota when Sam announced to the camera: “That’s the most fun I’ve ever had in my LIFE!” At that moment, she was not a TV personality doing a glossy travel show. She was a girl having herself some insane fun. I can vouch for that! Now, I’m sure that swimming with wild dolphins would have more spontaneity to it than the well-orchestrated session I had with my fellow tourists. But, still, even in the wild there are some rules you need to know if you’re going to swim with either dolphins or whales. These happy, gentle creatures have their boundaries and hard luck to the dumb human who violates them. (See Related Topics at the end for a good way to find out more.) Dolphin Discovery does provide a structured way to learn how to interact with dolphins, which is a good thing. 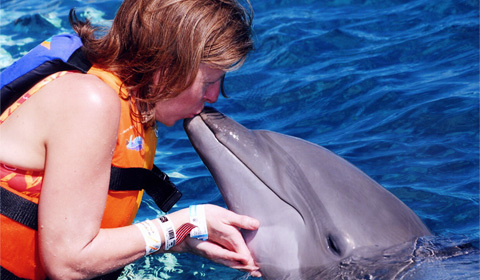 See the way my hands are positioned in the photo of me kissing the dolphin? That’s not some weird penchant I have for unnatural poses when being photographed. That was how I was taught to hold the dolphin’s chin to stay within the training protocol. You know, if I was a dolphin who had to interact with hundreds of humans every day and exhibit patience while being photographed dozens of times, I would want some boundaries, too. 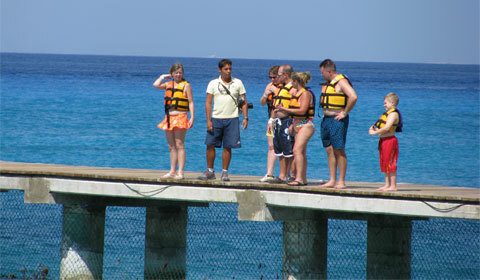 At Dolphin Discovery everything is well-organized and well-timed. Here we are on the dock, being educated by the trainer on everything from how to get into the water safely—there was an underwater ledge that we stood on whenever we weren’t out in the ocean pool interacting with the dolphins—to what would happen after the dolphins showed up. Despite my eagerness to get in the water, I definitely appreciated the time-out for cautions and what to expect. Getting to know our dolphins. That's me doing some swim-by petting. Here we are in the water during the early stages of the experience. Before graduating to the more daring adventures, we got to meet the dolphins, pet them and do other safe and easy games with them. Our trainer stood nearby, rewarding the dolphins frequently and using a special whistle to signal their next task. These dolphins loved to perform! Any qualms I had about poor, imprisoned dolphins being forced to do tricks for greedy humans disappeared in the joy of the experience. If these dolphins are suffering you could fool me. They clearly enjoy their performances and they have endless patience when they’re in bodily contact with the human participants. In one book I read, a writer who’s had frequent contact with dolphins says that some of them “volunteer” to be caught because they want to have relationships with humans . . . and performing in marine animal shows is one good way to act as ambassadors for their species. While we have no way of proving that, being in the presence of these dolphins in captivity made it much easier to believe. 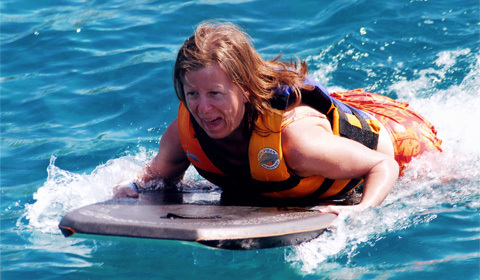 Being pushed by a dolphin on a boogie board = FUN! One of my favorite games, being dragged by an upside-down dolphin. Brian took lots of photos from his position as spectator on the shoreline (I still can’t believe he didn’t want to join me for this activity), but even with his zoom lens it didn’t quite capture the experience the way these close-ups do. Although extremely commercial and a little pricey, I did not regret paying for a package of professional photos and video. And if it helps provide better care for the dolphins, I’m all for it. After the session was over, I was so sad to be leaving the pool and I could have done that all day. And then again the next day! But at least we got to relive it by watching the videos that were shot while we were in the pool. That part dragged a bit—waiting around in wet gear to go into the tiny theater—but then everything seemed slower and dopier back in the human world after being with the dolphins. If I ever get to go back to one of the Dolphin Discovery parks, the one thing I’d do differently would be to ask for my ID tags to be put on the other wrist. All the kissing photos were shot from the right, so two of my best images from that day have those stupid tags looking like I just got out of the hospital. And, in a way, I did. The dolphin medicine was like being healed of my cares and worries. FTC Compliance: This is an independent review that I wrote because I enjoyed my visit to Dolphin Discovery during a 2007 cruise in the Caribbean—a trip that was 100% paid for by myself and my husband. If you make a purchase using the link above for the Bobbie Sandoz-Merrill book, I will receive a percentage of your purchase from the Amazon Associates program. See our Site Policies for more detail. 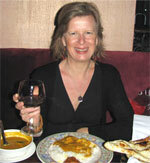 Julia – I’m pleased you enjoyed the review and thank you for reading. If this experience ever seeks *you* out, do say Yes. You’ll have such mind-blowing fun you’ll want to do it again straightaway. I cannot agree more — screaming from sheer enjoyment is the BEST look (not to mention feel!). You get to do so much. I envy you! The closest I ever got to this experience was petting a sweet dolphin named Suzie near a dock on Plantation Key – but even just doing that was fun; I can imagine how awesome your experience was (well, I can sorta imagine – helped along by the great photos!). 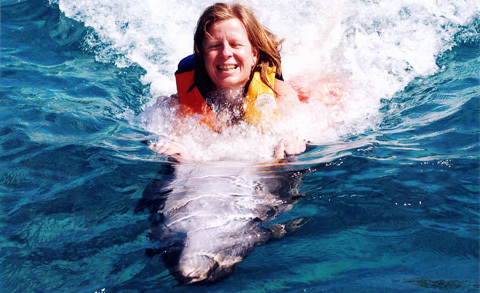 I agree, Karen, any encounter with dolphins is fun-fun-fun. Even just seeing them from a beach, leaping the waves. Glad you noticed the water. 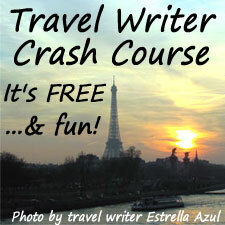 I’ll be commenting on that in the story I plan to do about Cozumel itself. We saw lots of beauty throughout the Caribbean, but the color of the water off Cozumel really made me feel the reality of where I was. (Things can seem a little unreal at times during a commercial cruise.) When I wasn’t totally immersed with the dolphins, I was drinking in that color, memorizing it for when I got back to the mainland, where it was wintertime. “If I ever get to go back to one of the Dolphin Discovery parks, the one thing I’d do differently would be to ask for my ID tags to be put on the other wrist. All the kissing photos were shot from the right, so two of my best images from that day have those stupid tags looking like I just got out of the hospital. I was obsessing on those tags on your arm and you’re right they do look like hospital tags, but it was precious how you related to it as dolphin medicine. That just cracked me up with joy! 😀 Catherine, I’m glad I could crack you up with that part of the story. I’m proud of those pix, but one time I dinked around in ImageReady for ages, trying to airbrush them out. But I couldn’t do it so I had to learn to ACCEPT. Yes, I was very lucky to live that dream and I hope I can do it again some day. I have it on my bucket list. I LOVE it! Swimming with the dolphins is something I would dearly love to do….but I am so severly allergic to ALL seafood, I’m not even supposed to get in the ocean. It looked like you had SO much fun. While I understand your concern about the dolphins, it’s pretty cool that they are well fed and get to play all day….cushy job! That’s a great way of looking at it, Ann. A cushy job. Yeah! They sure do get spoiled with plenty of love and attention. I’m so sad for you with those allergies. Not even to be able to get in the ocean! I hope something can shift for you in the allergy dept. And I wish we could swim with the dolphins together! 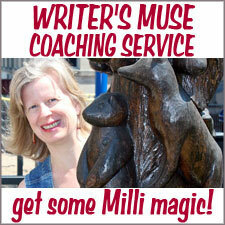 If you’ve been dreaming of doing it then it’s absolutely a foregone conclusion that you would love it beyond measure. Estrella ~ I’m tickled that part made you laugh! I’ve learned a lot from the dolphins, and I needed better boundaries myself, so I’m pleased you appreciated my joke. When I first tried to look at this, unrelated to your post, my computer crashed. I’ve been meaning to come back. So glad I remembered. I LOVE this post. Your joy in these pictures is so pure. I share your qualms about animals in captivity… and yet I’m so jealous, so wishing I could be that close to such remarkable creatures. Thank you for posting. I have such a big vicarious smile! Oh, and I loved this: “but then everything seemed slower and dopier back in the human world after being with the dolphins.” Yes! I bet! I knew you would understand perfectly. The idea of those wild creatures being penned up and having to perform the same tricks every day was not something I wanted to help perpetuate. But the experience in person changed my mind. I still have my reservations about it, but I also now see the merits. Perhaps even the dolphins would agree. Mike and I went on a dolphin encounter tour, from a cruise ship years ago. We didn’t get to swim with them, but it was and still is one of my travel highlights! I just loved getting a hug from “Andy” the dolphin we had our encounter with. The pictures of the swim look really fun! Betsy, I’m so glad you got to do that! They are such amazing creatures to interact with. The ones I got to swim with didn’t really show us their personalities (the fun swim routines where they were pushing and dragging us around didn’t really allow time for that) but the joy they spread is incredible no matter what. I’m not a bit surprised that your dolphin encounter is one of your travel highlights! Swimming with dolphins has been a dream of mine forever. I got to see wild dolphins on our vacation trip to Ocean City Maryland and that excited me. Wow! I love the pic of you actually riding the dolphin, that is definitely on my bucket list for sure! What an experience to be up close and personal with such beautiful and intelligent creatures! What a dream come true for you. Thanks for sharing your adventure. I really enjoyed every minute of it and I see you did too! 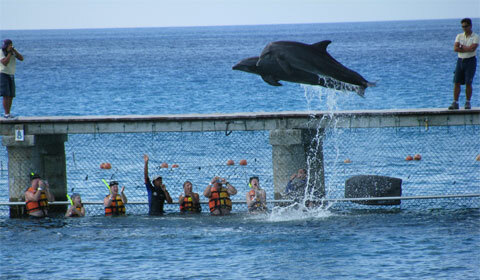 I am planning to go to coszumel dolphin discovery in January with 2 young kids. May I know how u take pictures with dolphin? Is it very expensive to buy picture with the discovery centre? 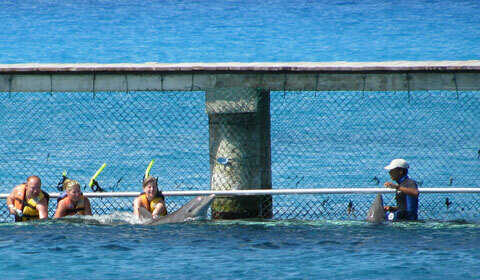 When I did my dolphin swim at Dolphin Discovery Cozumel my husband stood on the shore and took photos of me. However, it was too far away to show anything but the group experience. I was glad that I also purchased the professional photos from Dolphin Discovery. You can see the difference in the photos above. The ones that show me close up are the professional photos. The difference in price is $45 for each person. You can compare the prices by visiting this page at Dolphin Discovery: dolphindiscovery.com/cozumel. Compare the Dolphin Swim Adventure ($139 USD for adults/$89 for kids) with the Dolphin Swim Adventure Memories Package ($184 USD for adults/$134 for kids). I hope that helps. Have a wonderful time with the dolphins! I know your kids will love it.